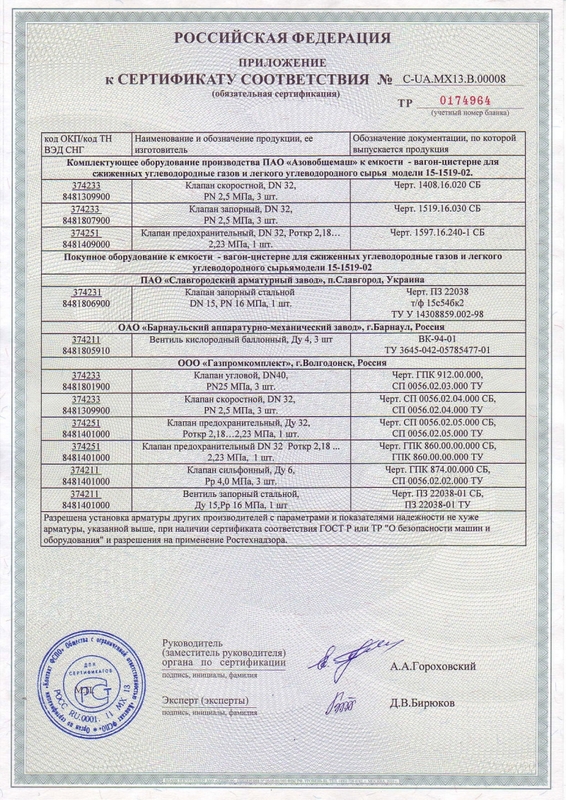 To ensure that produced equipment meets requirements of clients PJSC Azovobshemash and PC Azovelectrostal under the guidance of PJSC Azovmash carry out coordinated policy in sphere of quality. 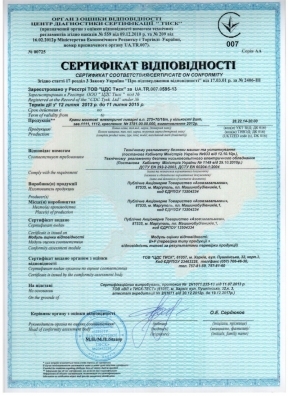 Such policy bases on comprehensive compliance with national and international quality standards, as well as on fulfilment of requirement of technical regulations of Ukraine and countries of the Customs Union. 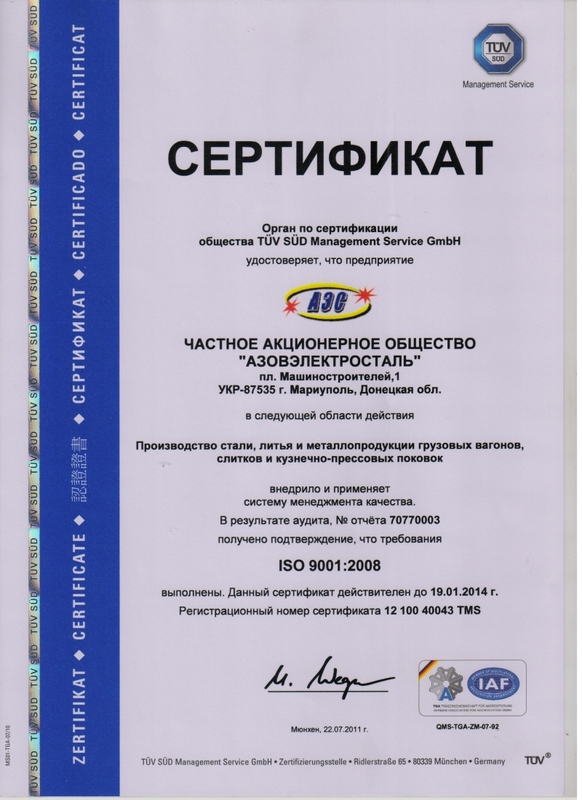 To manufacture products of guaranteed quality the plants developed, introduced and ensure functionality of the quality management system in accordance with international and national standard ISO 9001:2008 (DSTU ISO 9001-2009). 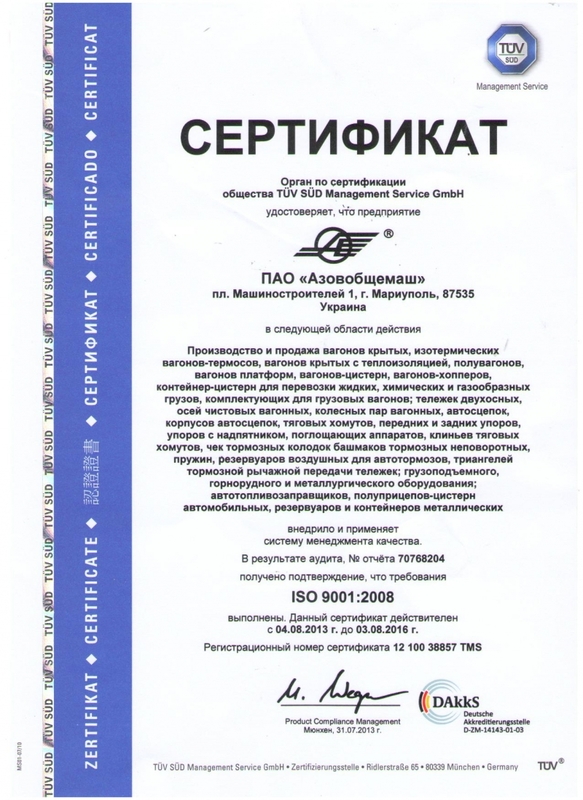 Quality manual and enterprise standards that regulated operation of the quality management system are obligatory for all structural divisions. 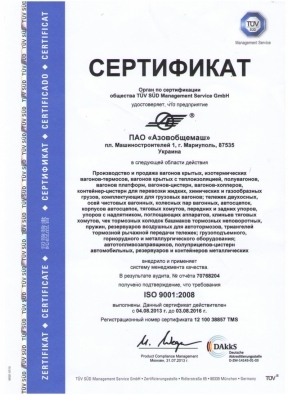 Correspondence of the quality management systems of PJSC Azovobshemash and PC Azovelectrostal to requirements of ISO 9001:2008 (ДСТУ ISO 9001-2009) was confirmed by authorized certificate authorities, such as TÜF SÜD Germany (certificates of conformity No. 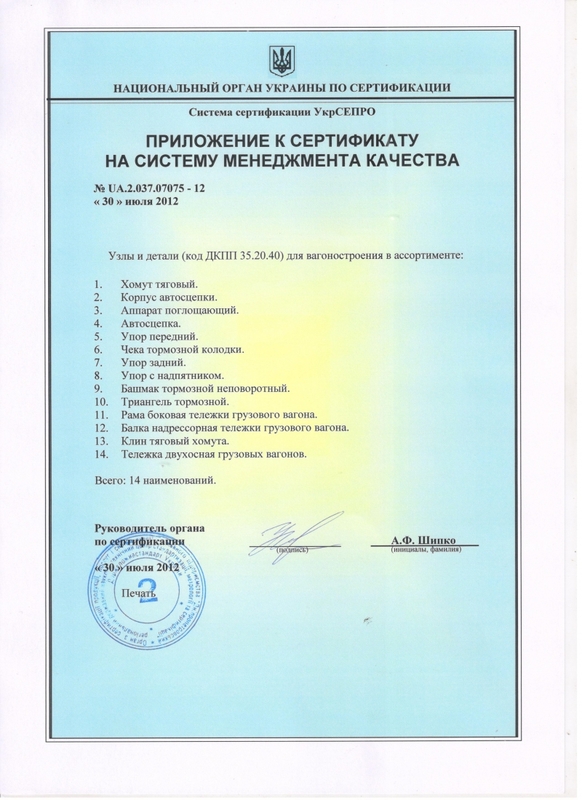 12 100 38857 TMS dtd. 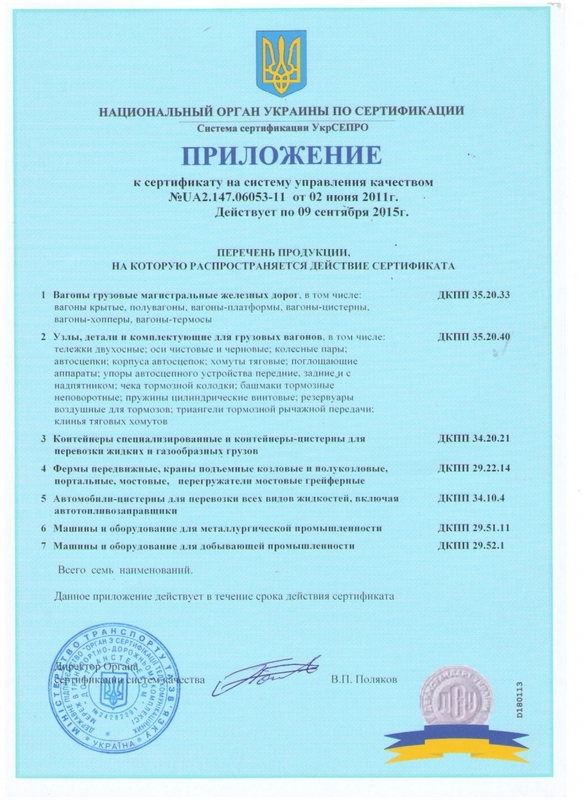 04.08.2013, No. 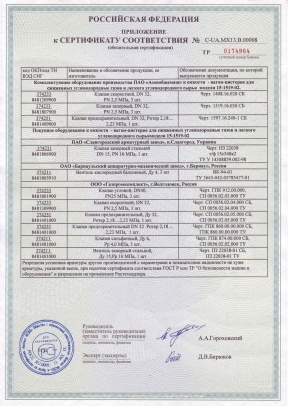 12 100 40043 TMS dtd. 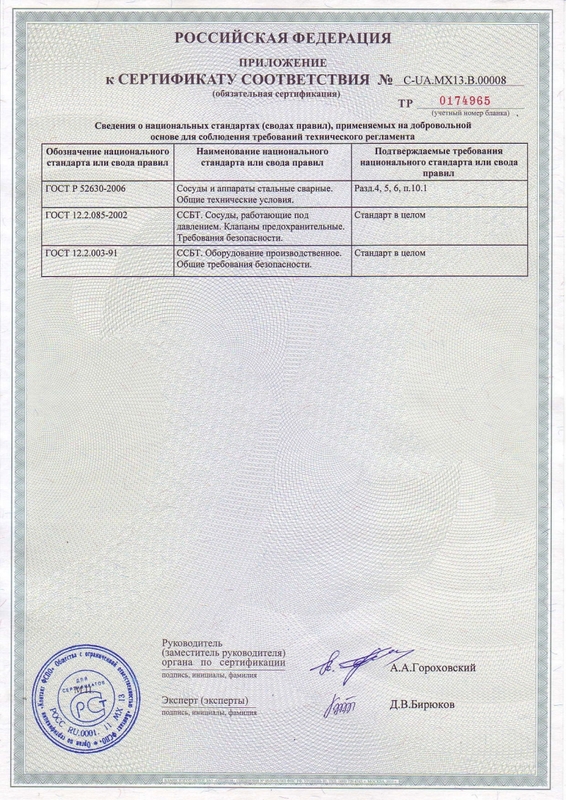 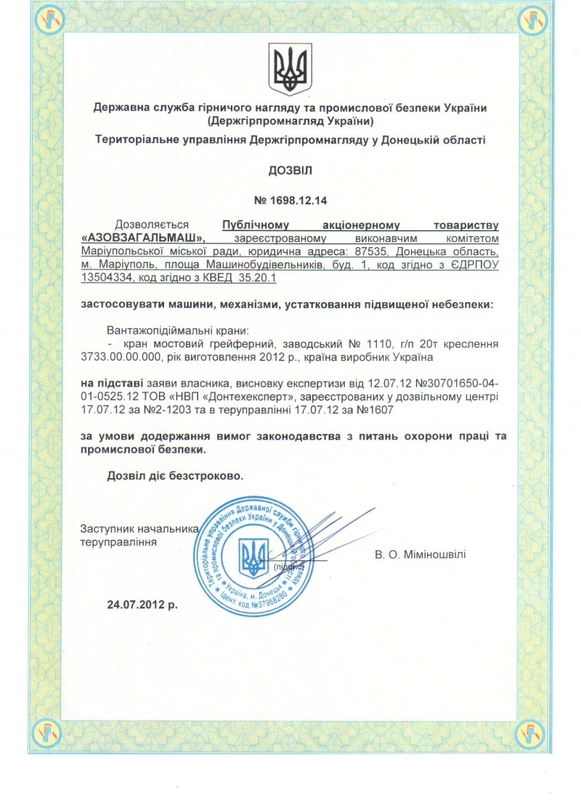 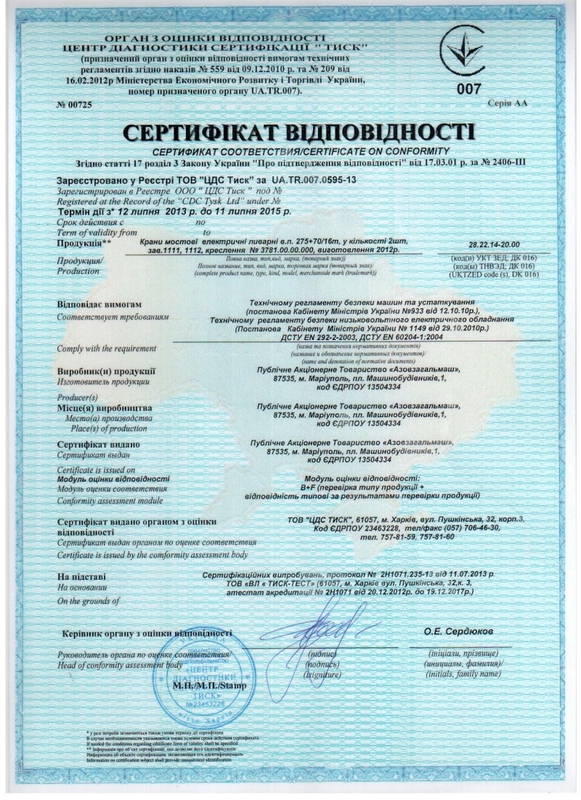 22.07.2011), Governmental Company «Dortranstelecom», Ukraine (certificate of conformity No. 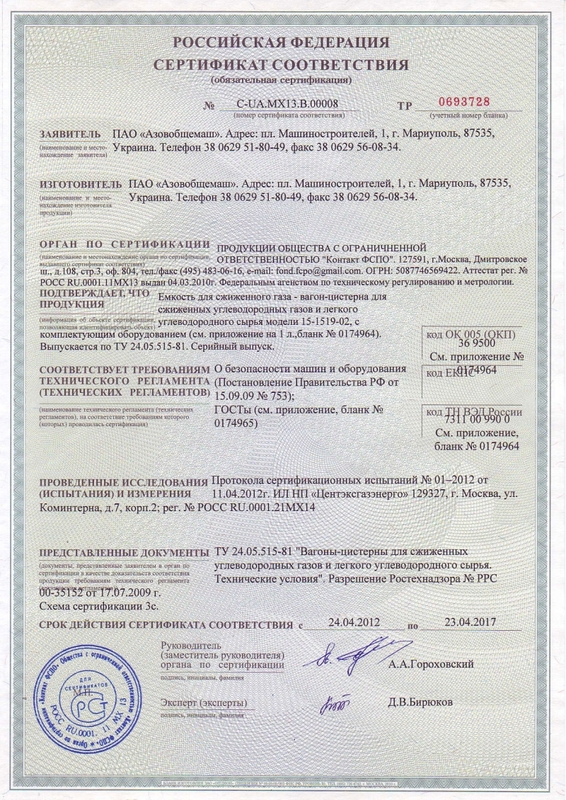 UA2.147.06053-11 dtd. 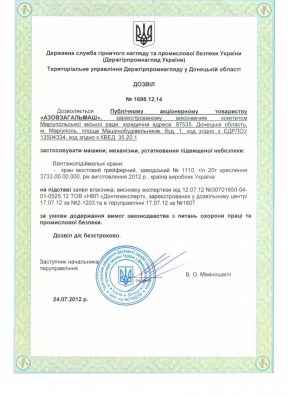 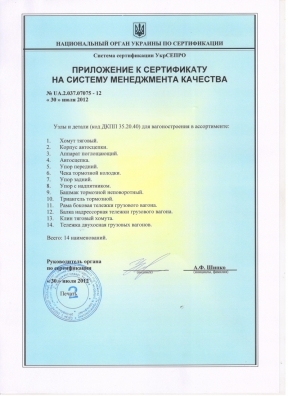 02.06.2011), Governmental Company «Dneprstandartmetrologia», Ukraine (certificate of conformity No. 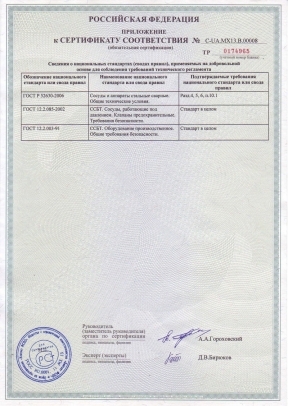 UA.2.037.07075-12 dtd. 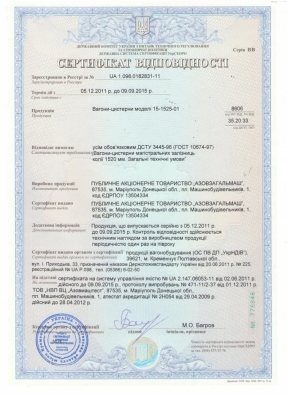 30.07.2012). 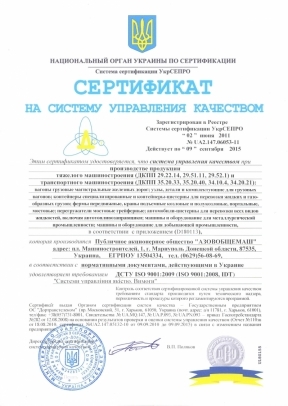 Certificates of conformity to technical regulations of Ukraine “About safety of machines and equipment”. 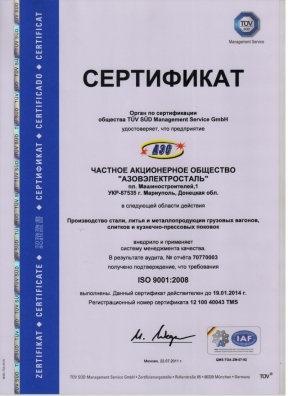 Stability of quality and safety of products is confirmed with the results of numerous supervision audits. 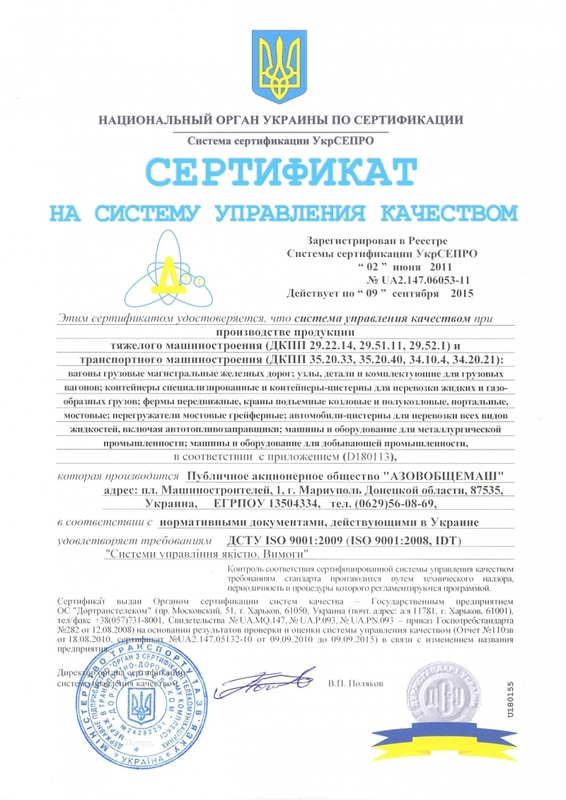 Freight cars produced by PJSC Azovobshemash repeatedly won National Contest “100 best products of Ukraine”. 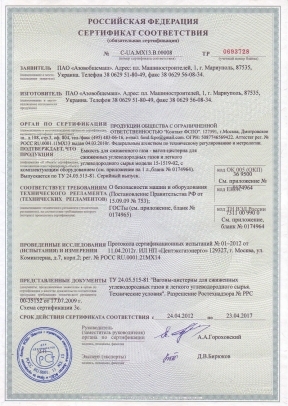 During its long-term history PJSC Azovobshemash and PC Azovelectrostal established reputation as reliable suppliers of qualitative and safe products with Azovmash trade mark. 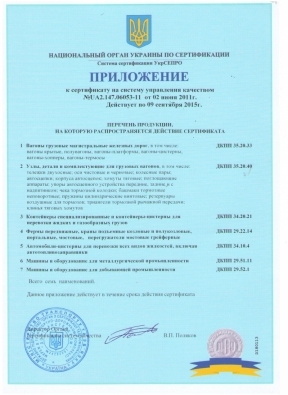 To support these positions PJSC Azovobshemash and PC Azovelectrostal perform works on introduction of IRIS – international railway industry standard. 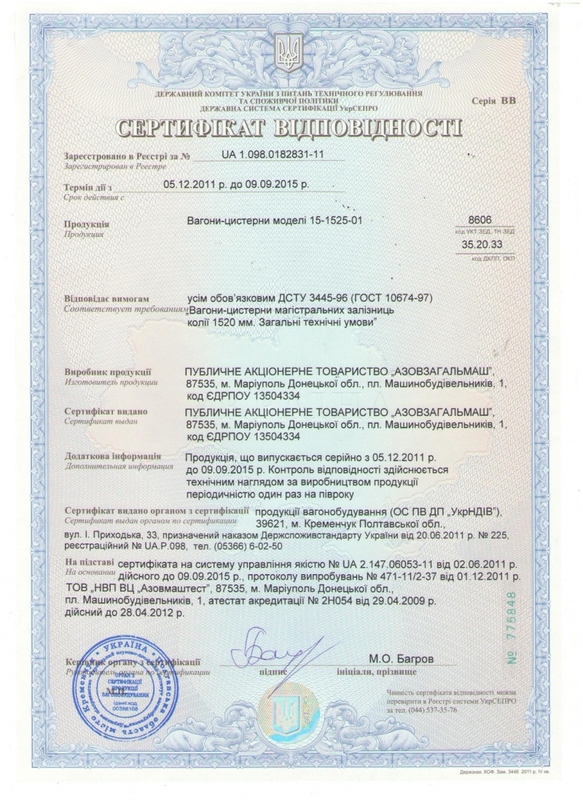 All actions and certification of the business management system in certificate authority accredited by the Association of the European Rail Industry UNIFE planned to be finished in 2014.